There’s no surprise that the humble little butterfly is one of the most popular insects among both adults and children alike. When it comes to craft projects, the butterfly’s popularity also remains strong, with many wanting to incorporate them into everything from costumes and brooches, to coloring pages and home decor. We’ve rounded-up 50 wonderful butterfly craft ideas, all involving this vibrant and stunning critter. You won’t want to miss these, so be sure to check out each one below! How adorable are these little felt butterflies from A Cultivated Nest? They’re incredibly simple to create and are a fun activity for the kids on weekends! These DIY butterflies from Artful Parent are just one of the wonderful things you can create using paper plates! Children will love decorating them too. These crafty and cool butterflies from Artsy Momma are created using washi tape, so you can incorporate every pattern that your heart desires! 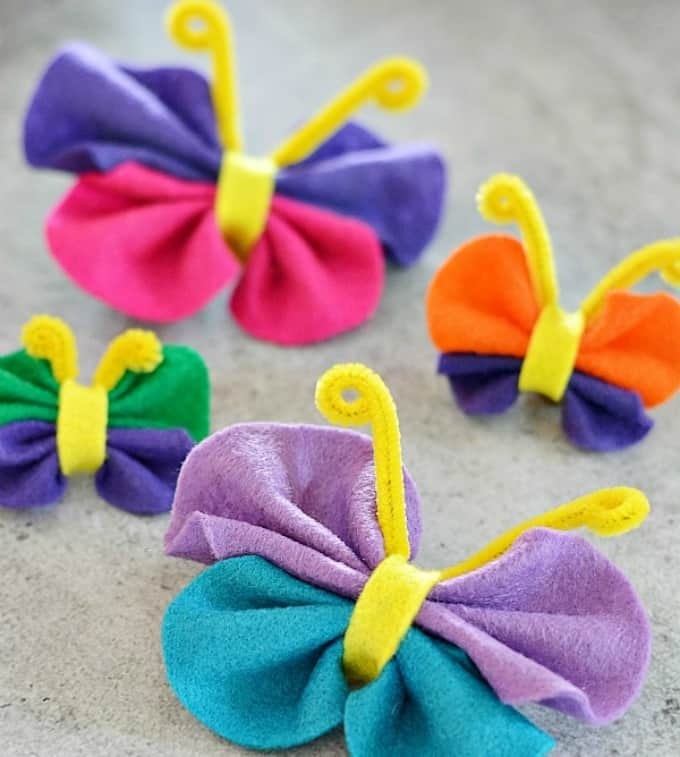 With some pretty pink tulle and a peg, you too can create these butterflies from Ben Franklin Crafts. Peg them onto your child’s curtains as a surprise! Here is another awesome way that you can turn tulle into a butterfly, thanks to Birds Party. These will also make wonderful additions to cards or as present toppers. The best thing about these colorful DIY butterflies is that you can glue them onto some card stock and frame it for the ultimate masterpiece. Check out Bright Star Kids’ tutorial to see how it’s done! If your child is in need of some seriously cool fancy dress costumes, why not create these amazing DIY butterfly wings from Buggy and Buddy? They’ll certainly steal the show! 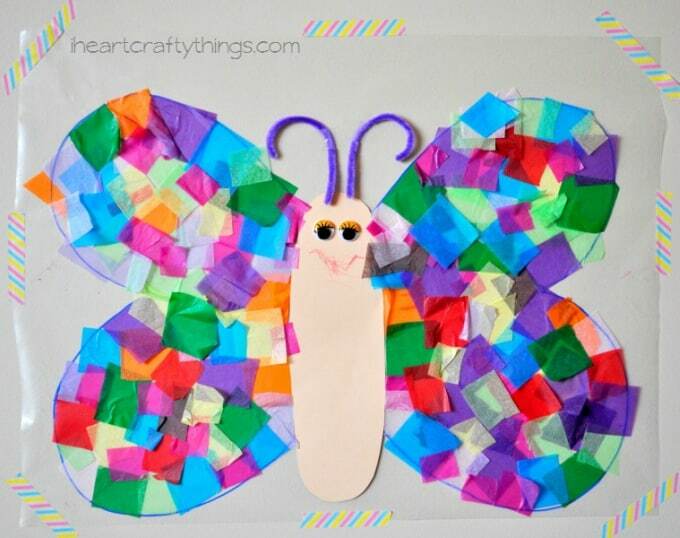 Here’s a butterfly craft which is both fun and educational! Buggy and Buddy has created a butterfly life-cycle diagram using a paper plate and creative materials such as tissue paper and pipe cleaners. These butterfly brooches from Consumer Crafts are pretty special – anyone would love to receive these as a gift! Follow the tutorial to re-create your own. Whether you’re an expert at quilling or simply a rookie, you’ll still find this DIY quill butterfly project from Crafting Creatures to be very fun! Mix and match paper using your favorite colors for that extra special touch. 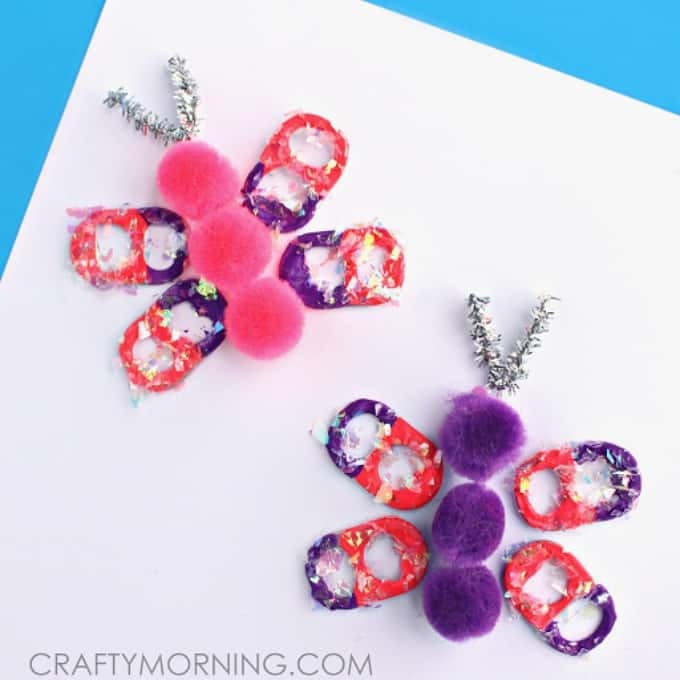 With a few soda pull tabs and fuzzy pom-poms, you too can recreate these adorable butterflies from Crafty Morning! These are sure to be a crowd-pleaser amongst kids too. Here’s another fantastic crafty butterfly idea aimed towards the little ones, this time using an old egg carton. Check out the full tutorial from Crafty Morning! These DIY butterflies could not be easier! Crafty Morning has created them using cupcake liners, wooden pegs, and plenty of glitter. Using pasta to create butterflies? Genius! Crafty Morning will show you how she made this wonderful and colorful DIY butterfly art. Here’s another butterfly craft which is sure to win over the kids. This DIY caterpillar changes into a butterfly – all with the use of wooden sticks and some paint! Danielle’s Place will tell you how it’s done. This stunning work of art by Davona Douglass won’t look out of place in any home. First you’ll need to create your own paper butterflies (using this tutorial), then simply assemble them onto a small wreath. Too easy! Next time you throw a party, why not make these butterfly invitations, just as DIY Inspired has done? They look stunning and are sure to surprise guests! Here’s a fantastic DIY project to use as party décor which incorporates butterflies! DIY Inspired will show you how to make these lovely butterfly-clad lanterns. It’s time to get creative and embrace coloring in! Easy Peasy and Fun has been generous enough to offer everyone these free butterfly coloring pages. Once you’ve finished, be sure to frame your work! Did you know that it was possible to create a butterfly masterpiece using old silver spoons? This wonderful project inspiration can be found via Express Your Creativity. Creating butterflies from ribbon has never been more simple, thanks to this step-by-step tutorial via Fab Art DIY. You’ll want to make more than one of these! These DIY butterflies have been made using clear plastic and nail varnish – Incredible! Thanks to Fab Art DIY, you can create a pretty replica of your favorite flying insect. If you love crochet and butterflies, then you’ll be pleased to hear that Fine Craft Guild has a wonderful tutorial for you combining these two things. It’s time to get crafty! Here’s a very simple vide tutorial from For Every Mom teaching you how to create paper butterflies. Show your kids and they’ll be instantly in awe! Forget traditional Papel Picado’s when you can make one using eye-catching butterfly shapes instead! Happy Thought will guide you through the process with ease. Such a lovely collection! Thank you for including the Light Catchers that Kelly from Typically Simple shared on By Trish Sutton.